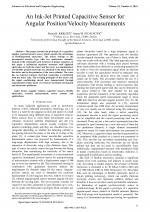 KRKLJES, D. B. , STOJANOVIC, G. M.
This paper presents the prototype of a capacitive angular position/velocity sensor which exploits the advantages of flexible/printed electronics. The sensor belongs to the incremental encoder type with two quadrature channels. Instead of the commonly used structure of planar capacitor, in this paper a cylindrical capacitor structure with digitated electrodes, for both the stator and the rotor, was implemented. The flexible printed electrodes are attached to the inner wall of the stator and to the perimeter of the rotor cylinder. The rotor has no external contacts; electrical connection is established with the stator only. The working principles of the sensor and the signal conditioning circuit were demonstrated through experimental results based on in-house developed mechanical and electronics platforms. L. K. Baxter, "Capacitive Sensors", IEEE Press, New York, pp. 38-40, 1997. 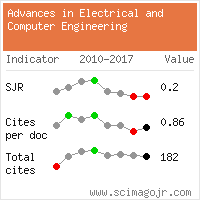 Citations for references updated on 2019-04-21 08:55 in 113 seconds.